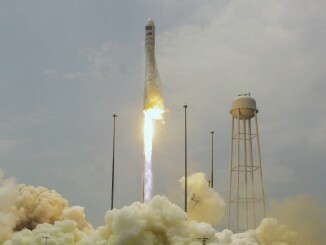 Facing pressure to find a ride into space for its commercial Cygnus cargo craft in the wake of a catastrophic rocket failure, Orbital Sciences Corp. says it has found openings in the mission manifests of the world’s busiest launch operators to accommodate resupply flights to the International Space Station next year. In a business where rocket reservations are typically finalized two years in advance, Orbital is entering the market less than a year before it hopes to resume cargo deliveries to the space station using another company’s launcher. David Thompson, Orbital’s chairman and CEO, said Wednesday the company is looking to launch one or two logistics flights on other rockets to the space station while reengineering its own Antares booster with a new engine to replace the aging Soviet-era powerplant believed to have caused a dramatic mishap seconds after liftoff Oct. 28 from Wallops Island, Va. Such late launch bookings are not unprecedented. Commercial satellite companies have moved their spacecraft to alternate rockets after launch failures before, sometimes finding rides less than a year away. But the intricacies of a cargo mission to the space station — including how to load equipment into the supply ship at a new launch site — are different than the requirements of most commercial communications satellites, space industry sources said. Launch providers may need to find a way to accommodate loading of the Cygnus spacecraft with time-sensitive experiments, fresh food and other supplies just before liftoff. Thompson said Wednesday the company has narrowed its options to three launch providers which have openings as early as the second quarter — between April 1 and June 30 — of next year. Two of the launch providers are based in the United States. 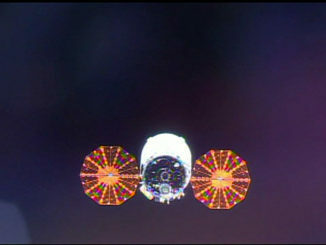 Orbital could also launch Cygnus missions with a European-based company, Thompson said. The contractors under consideration are presumably United Launch Alliance, SpaceX and Arianespace. All three companies have a busy slate of launches planned for 2015, but Orbital has apparently found openings. SpaceX’s Falcon 9 rocket has up to a dozen missions on the schedule next year. Around nine or 10 flights of ULA’s Atlas 5 booster are on the manifest for 2015, plus around four Delta 4 missions. Arianespace manages Ariane 5 and Soyuz rocket missions from a European-run spaceport in French Guiana, with at least a half-dozen Ariane 5s and around four Soyuz launches tentatively planned for 2015. The Ariane 5 is tailored for launching two telecom satellites at one time into orbits much higher than the International Space Station, but the launcher has dispatched cargo ships to the complex before with Europe’s five Automated Transfer Vehicles. The ATV is a much larger spacecraft than Cygnus, which could be a fit for the medium-class Soyuz rocket Arianespace flies from Kourou, French Guiana. “We expect to work with NASA to determine the most favorable combination for one or two gap-filler missions using third-party launch vehicles and are aiming to make final decisions on the best way forward over the course of the coming month,” Thompson said. Thompson said the Cygnus spacecraft’s “inherent flexibility” allows it to be launched on several different types of rockets. The next Cygnus spacecraft will fly with an extended pressurized cabin about one meter (3.3 feet) longer than cargo modules on earlier versions of the supply ship. The pressurized component of Cygnus is built by Thales Alenia Space in Turin, Italy. The enhancement — coupled with other changes such as a new type of solar panels — will allow Orbital to take up more pressurized cargo to the space station. Cygnus has more internal volume than SpaceX’s Dragon supply ship — NASA’s other commercial cargo provider — but Dragon can haul up unpressurized experiments, large external parts for the station, and can return specimens to Earth. NASA is paying Orbital $1.9 billion to deliver 20 metric tons — about 44,000 pounds — of supplies to the space station in eight cargo missions. SpaceX’s contract is worth $1.6 billion to carry up the same cargo load in 12 flights. Orbital Sciences says flying one or two Cygnus missions on more powerful third-party launchers, then introducing a new engine on its Antares rocket for launches beginning in 2016, will allow the company to complete its 20 metric ton cargo commitment in seven missions instead of eight flights. 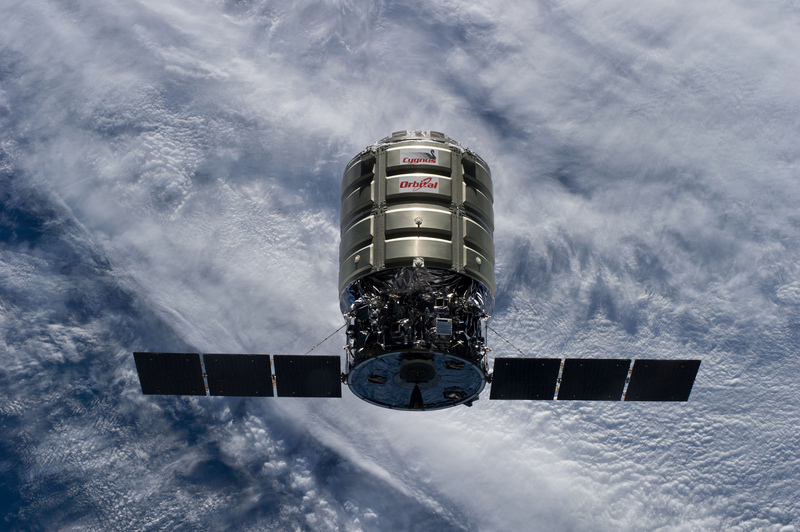 Depending on what launcher Orbital chooses for the Cygnus missions next year, each resupply flight could take up to 3,300 kilograms (7,275 pounds) of gear to the space station. Under previous plans to launch them all on Antares rockets — with the less powerful AJ26 engine implicated in the Oct. 28 launch mishap — the company expected each Cygnus mission to carry up to 2,700 kilograms (5,952 pounds) of supplies. Thompson said the seven flights should be completed by the end of 2016, the same timetable Orbital officials expected before the Oct. 28 launch failure. 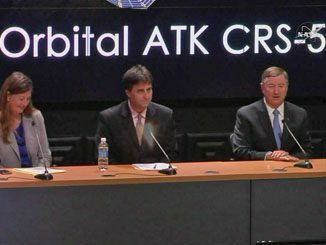 “We will accomplish these actions with no cost increases to NASA under our CRS (Commercial Resupply Services) contract,” Thompson said.